Scallops au Gratin with Jarlsberg Cheese. A delicious appetizer or lunch. 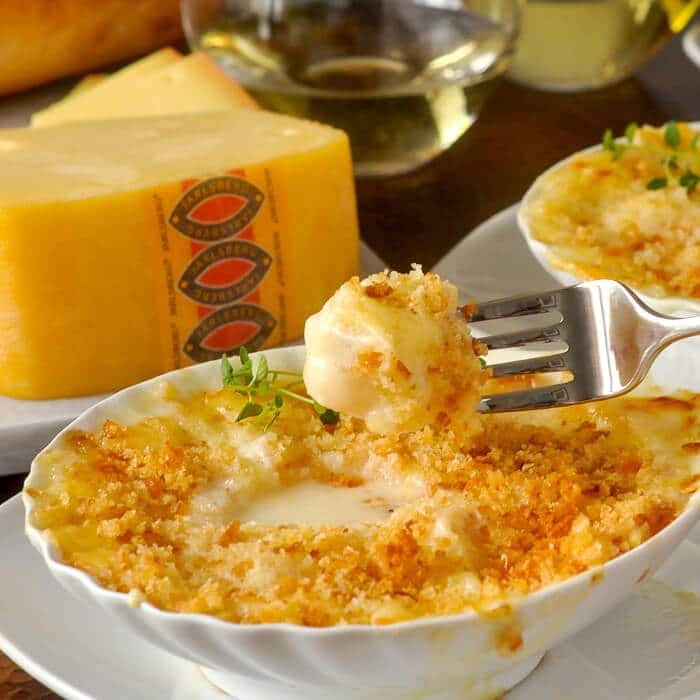 Scallops au Gratin with Jarlsberg Cheese, an indulgently delicious appetizer course or served with a side salad and crusty bread for a special lunchtime meal. When I was first asked to develop a recipe using Jarlsberg cheese, my mind went in several directions; from a cheese and potato soup to a spring vegetable and Jarlsberg quiche. I’ve always enjoyed the mild flavour of this cheese but I quickly then thought of how well it would pair with seafood. The natural sweetness of scallops was my first thought because the cheese itself has a slightly sweet undertone and a buttery richness that would also echo the rich natural flavour of the scallops. Delicate seafood like scallops shouldn’t be paired with strong cheeses because their flavour can overwhelm the dish. The mild flavour of Jarlsberg with its nutty tones turned out to be perfect for this scallops au gratin recipe. Scallops au Gratin with Jarlsberg Cheese ready for the oven. Here in Newfoundland, crab au gratin and cod au gratin are incredibly popular. My own recipe for Cod au Gratin has been one of the most popular ever on this blog and in my first cookbook. It was time I made a version using my favourite seafood, scallops. I kept it very simple using only a creamy cheese sauce flavoured with garlic and fresh thyme, then topped with more Jarlsberg cheese and some buttery breadcrumbs. The result was utterly delicious. This dish would make an incredible starter course for a celebration dinner or dinner party. Spouse and I enjoyed it with a simple side salad and a glass of crisp white wine for lunch. Some great crusty bread is practically a must to serve with it as well. I broke off small pieces of baguette to dunk in the cheese sauce that was infused with the flavour of the scallops. I wiped the gratin dish clean with that bread and savoured every delectable morsel. Like this Scallops au Gratin recipe? 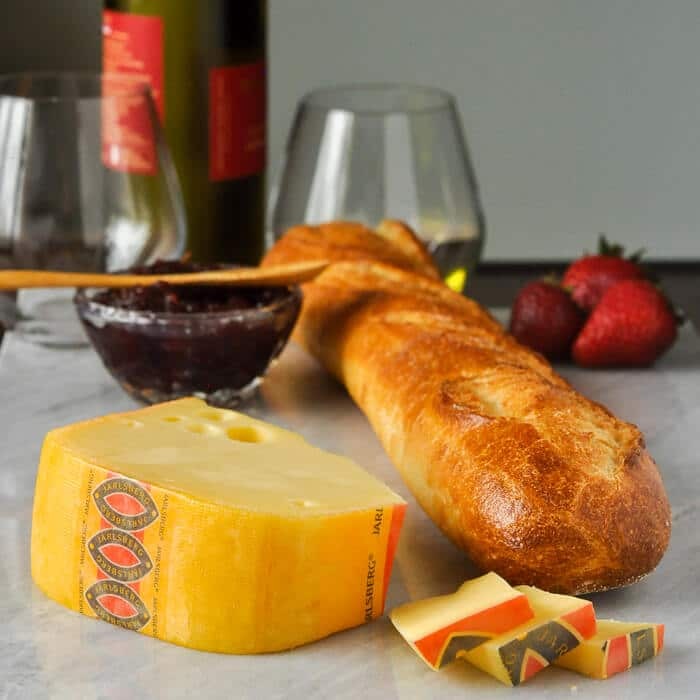 To learn more about Jarlsberg cheese and for more great recipes visit the Jarlsberg website. 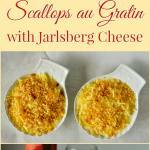 Rock Recipes is pleased to have Jarlsberg cheese as sponsor of this recipe post. Compensation has been provided for this content by the sponsor but the opinions expressed are entirely my own. You’ll find many more recipes in our Fish & Seafood Category. You might also like our recipe for Shrimp Cakes with Lime Cilantro Aioli. Meanwhile, in a medium saucepan melt the the butter over low heat and add the garlic. Cook for only a minute to soften the garlic but don't let it brown. Add the flour and cook together for 2 minutes. The flour mixture should appear foamy. Again do not let this brown. Slowly pour in the scalded milk whisking constantly. Cook until the sauce begins to thicken. Season with salt and pepper to taste. Stir in 1 cup of the grated Jarlsberg cheese. 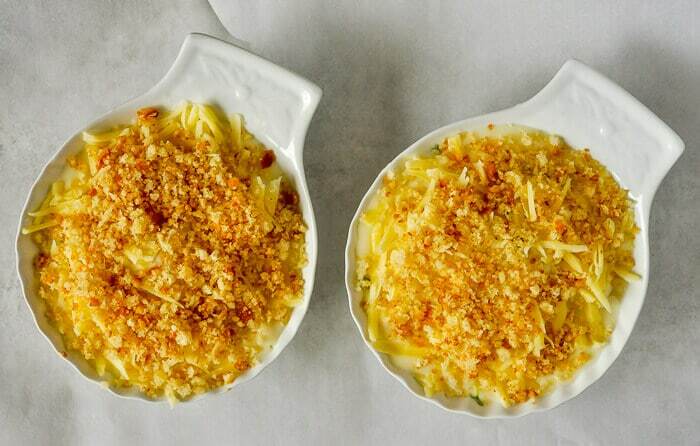 Arrange the scallops in the bottom of 4 small individual gratin dishes. A small glass casserole dish about the size of a loaf pan will also work if making this in a single pan. Sprinkle the chopped thyme over the scallops. Spoon the sauce over the scallops. Top with the remaining grated Jarlsberg cheese. Mix the bread crumbs with the melted butter and sprinkle over the cheese. Place the individual gratin dishes on a baking sheet. Bake for about 30 minutes at 350 degrees F until the sauce is bubbling and the top has evenly browned. Serve immediately. Hi Barry, For sure you don’t saute the scallops? I trust all your recipes but I’m afraid the scallops might be too wet? I kind of allow for the liquid in the scallops by making the sauce pretty thick. I find fresh scallops actually release less liquid than frozen or previously froze. If using previously frozen you can pan sear large scallops for a minute or less per side if you like. That should help release the moisture if you let them rest for 10 minutes before adding to the gratin dish/es. Hope this helps. B. They are previously frozen so I think I will sear them, thanks so much for your prompt reply and your fabulous work!